Designed to fit the larger seat and flap of the all purpose saddle, this Fleeceworks pad can also be used under larger close contact saddles (18"+). The pad features a full rolled edge with integrated opening for the girth. Dense 1" sheepskin under the points of the saddle tree provide maximum protection. The bi-level design shears down to 1/2" sheepskin under the saddle flap to allow for close contact. Ideal for use schooling or in the show ring. 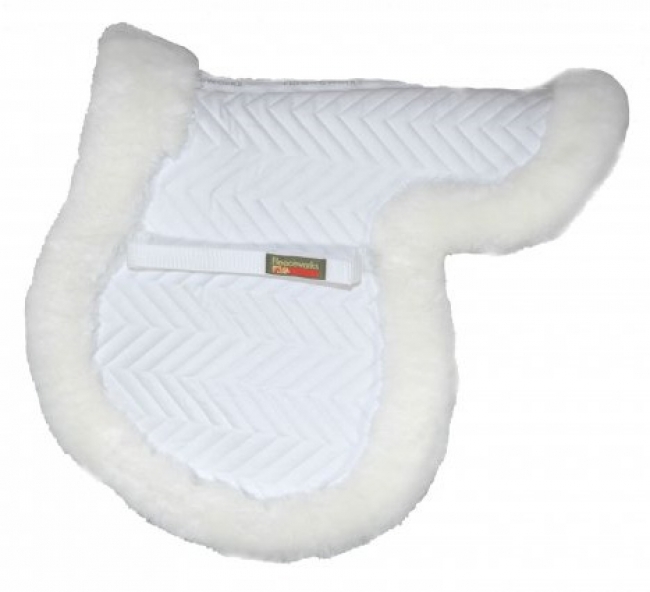 You also receive a Fleeceworks Baby Pad with the purchase of this Fleeceworks saddle pad! Machine washable-cold water, gentle cycle with Leather Therapy Wash and Conditioning Rinse.